Simply pan fry for 4-8 minutes... or quickly sear, leave the tuna to rest, melt the butter in the pan until bubbling and pour over. Expertly cut from the whole loin, with an aromatic spiced butter. …Ready to pan fry for 4-8 minutes. 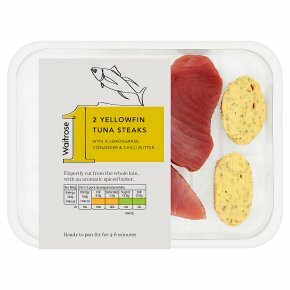 INGREDIENTS: yellowfin tuna (Thunnus albacares) (fish) (87%), concentrated lemon juice, unsalted butter (milk), lemongrass, lime leaf, red chillies, coriander, lemon juice, cornflour, sea salt, ground white pepper, chilli, cumin, salt, oregano, garlic.